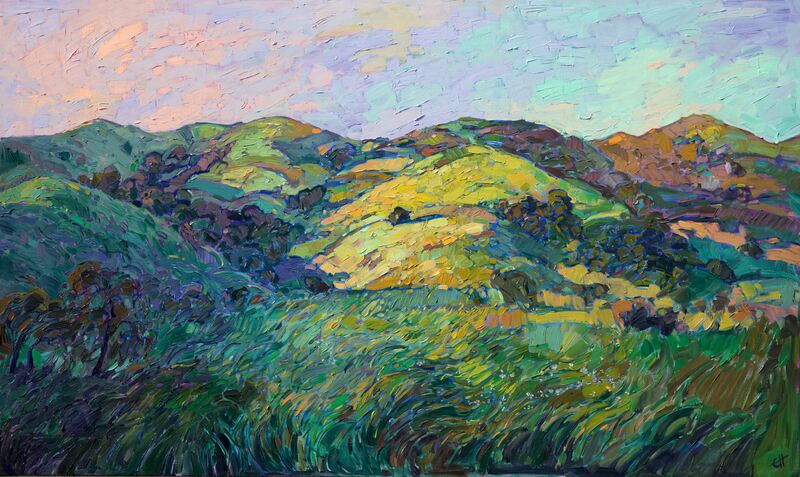 Erin Hanson’s impressionist paintings depict the geographical diversity found in states like California, Nevada, Utah, Washington, and Oregon. 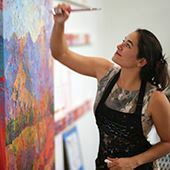 She paints everything from wooded areas to mesas or deserts. 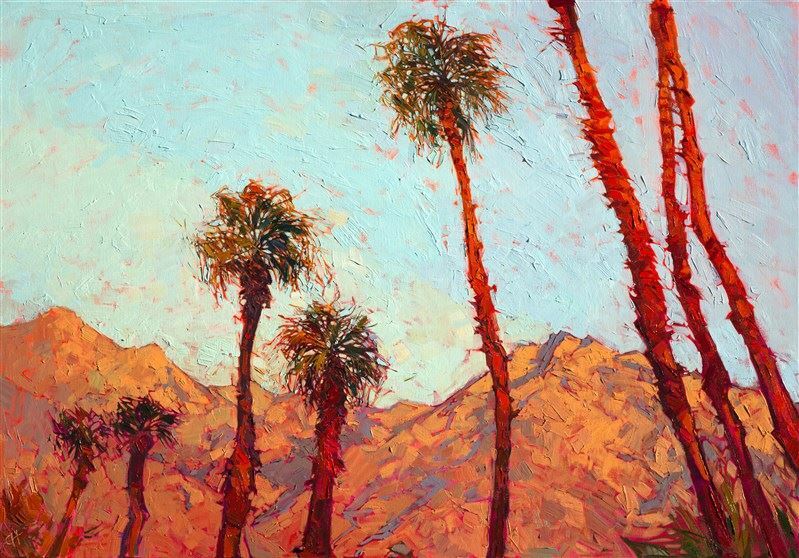 Hanson has often visited and frequently paints the incredibly distinctive landscapes in Borrego Springs. Borrego Springs is a unique California town. Surrounded by a 600,000-acre State Park in San Diego County, it is the only desert community in San Diego County. This town lies in a valley and is surrounded by desert. The land stretches out to the surrounding mountains. This makes Borrego Springs an incredible spot for beautiful color combinations. The startling blue skies are a glorious contrast to the sandy desert, wildflowers, and the the looming mountains. Additionally, the varying play of light on the sand and the colors of the changing seasons provide ready-made inspirations for landscape painters. The Anza-Borrego Desert State Park that surrounds the town of Borrego Springs is a remarkable place. Filled with wildflowers, ocotillos, cactus, big horn sheep, and birds of all sorts, the park is host to an astonishing mix of color. When most people think of the desert, they think of barren wastes with maybe a cactus or lizard. The Anza-Borrego State Park shows that this notion is incorrect. Each season teams with a different kind of life and color, from tan sands to red and yellow blossoms to purple mountains, this State Park surprises visitors and even Borrego Spring residents every year with its diversity of wildlife and color. 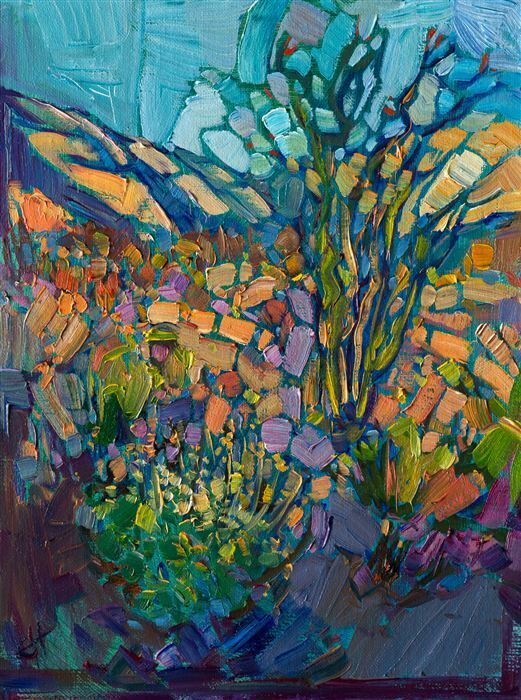 Borrego Springs turns into a mosaic of color in the spring; the landscape becomes peppered with abundant flowering ocotillo, one of Erin Hanson’s favorite subjects to paint. You can see her love of these flowering cacti along with the sheer diversity of color found in Borrego Springs in her Ocotillo Triptych. Borrego Mosaic not only showcases the vibrant peaches, blues, and greens found in the desert, but it also demonstrates the sheer animation and movement in this desert landscape. The world in this place is alive. It isn’t a dried-up desert. There is an interaction of motion and life and beauty shown in this painting. 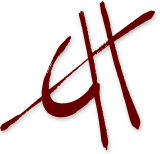 Another factor that is clearly demonstrated in all of Erin Hanson’s work is that she creates the color for each painting. There is no way you can find these combinations of color in any store-bought paint. 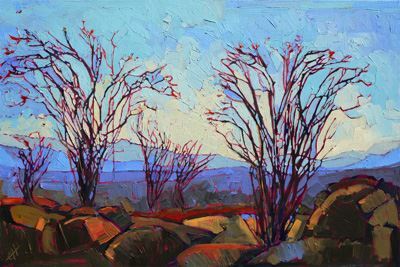 Instead, Hanson mixes her colors from just a few basic primaries to create the colors that suit the scene she is painting. The variety of colors that can be formed and the artistry that goes into these celebrations of color becomes increasingly apparent that more one looks at her works. 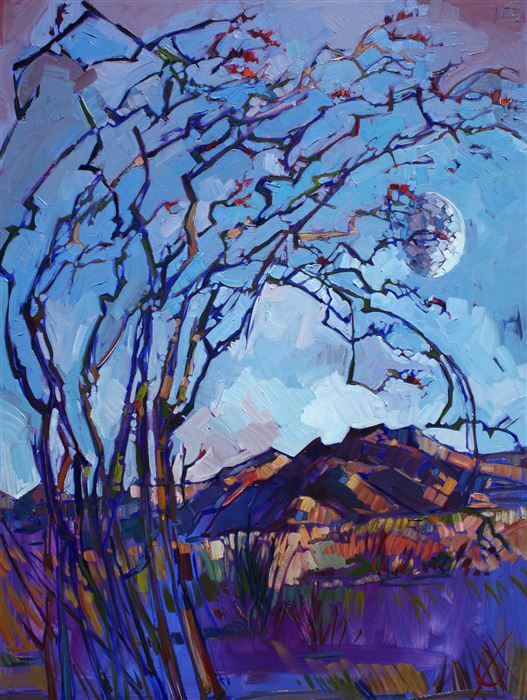 With the variety of landscapes offered by Borrego Springs and the Anza-Borrego Desert State Park, it is no wonder that Erin Hanson chooses to depict this amazing place in so many paintings. You can see her entire Borrego Springs collection here. We hope you enjoy the diversity and beauty found in these works.